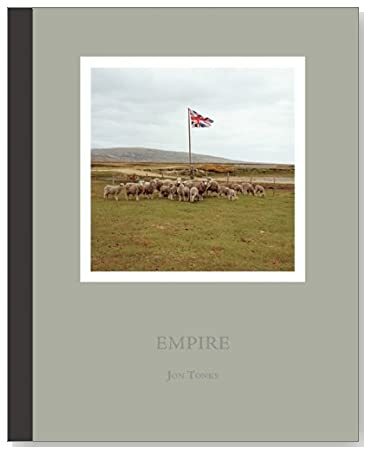 Book Review Empire By Jon Tonks Reviewed by Colin Pantall St Helena is the island in the middle of the Atlantic where Napoleon was exiled to. The Falklands are the islands in the middle of the Atlantic (West Side) over which a war was fought in 1981. Ascension Island is the island in the middle of the Atlantic where British planes refuelled on the way to the Falkland Islands in that same war. And Tristan de Cunha? Well, it rhymes with tuna and is not to be confused with Tierra del Fuego. Dewi Lewis, 2013. 188 pp., 85 color illustrations, 10x7¾". St Helena is the island in the middle of the Atlantic where Napoleon was exiled to. The Falklands are the islands in the middle of the Atlantic (West Side) over which a war was fought in 1981. Ascension Island is the island in the middle of the Atlantic where British planes refuelled on the way to the Falkland Islands in that same war. And Tristan de Cunha? Well, it rhymes with tuna and is not to be confused with Tierra del Fuego. My guess is it’s an island somewhere in the middle of the Atlantic where not a lot happens. I flick open an atlas, get out a magnifying glass and my thoughts are confirmed. All these places are tiny dots in the ocean that are isolated and unheard of. They’re all British though and they’re all populated. And that’s where Jon Tonks’ Empire comes in; a lovely book that looks at the geography, customs and people of these small islands. The Empire theme is apparent in the layout of the book. Maps, facts and figures are laid out with a graphic nod to an imperial tradition, but the delight of the book lies in the pictures and the stories they tell. Empire. By Jon Tonks. Dewi Lewis, 2013. There is still a problem finding a partner and if you do find a partner the next problem is finding a house. If you want your own house you have to build it. But there is a bar, a school, a supermarket, a café, two churches and, as one great picture shows, a couple of lifeboats washed up by a storm onto the volcanic slopes of a Tristan Cliffside. Ascension Island is even more rocky and the pictures from here focus on the military side of empire; the island is essentially a British airforce base as shown in a picture of a block of Royal Air Force housing carved into a chocolate brown slab of volcanic rock. Here things aren’t quite so cosy; inhabitants don’t have right of abode even if born on the island and the part the island plays in both military and civilian communications (it’s the site of one of the five GPS ground antenna) give it a sinister edge. Alien landscapes, scenes of community and traces of empire are the hallmarks of Tonks’ book. On the Falkland Islands, we see a cluster of sheep gathered around a Union Jack, a street named Thatcher Drive and the Governor of the Falkland Islands in full colonial regalia.